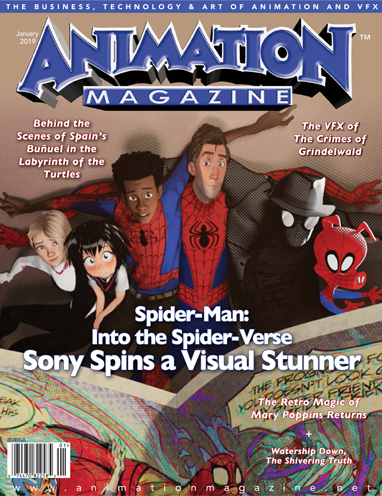 Sony Pictures Animation’s Spider-Man: Into the Spider-Verse delivers a fantastic-looking adventure, featuring many diverse versions of Marvel’s beloved webslinger. Spanish director Salvador Simó puts an animated spin on a special chapter in Luis Buñuel’s life and career in the movie Buñuel in the Labyrinth of the Turtles. Director Rob Marshall discusses his visual inspirations and the charming retro animation of his new movie Mary Poppy Returns. DreamWorks Television Animation marks five amazing years of creating hit shows for the streaming era. Richard Adams’ hugely popular novel Watership Down is adapted into a stunning new four-part animated miniseries, which arrives on Net ix this month. Adult Swim’s latest series The Shivering Truth is everything you might expect from the insane stretches of Vernon Chatman’s brilliant, twisted mind. Red Giant’s Trapcode Suite 15, Adobe Premiere Rush and Side Effects Houdini 17. The new documentary Never-Ending Man paints an insightful picture of Hayao Miyazaki as a tireless perfectionist. A starry-eyed miniature horse dreams of pulling Santa’s sleigh in the new Canadian holiday movie Elliot: The Littlest Reindeer.